Mantra: Believe in yourself. We do. 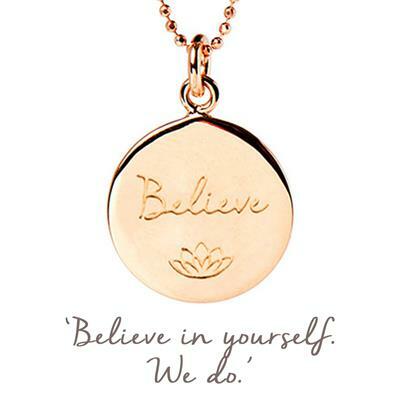 The 18 carat Rose Gold plated, 925 Sterling Silver necklace carries the word 'Believe' and features the iconic mantra lotus. Also available in 925 Sterling Silver or plated in 18 carat Gold. The perfect pendant for a big interview coming up, exams, courses or a challenging event on the horizon. Wear your 'Believe' mantra for self-belief and to remind you that everyone is cheering for you!